At a Glasgow's Whisky Club tasting, John Campbell, distillery manager at Laphroaig, led us through a tasting of five whiskies, and provided some very interesting background material. We started with the Ten Year Old, which, along with the cask strength Ten and the Quarter Cask, accounts for 95% of the distillery's 3.4 million litres annual output. It is matured exclusively in first fill ex-Bourbon barrels, a policy which has been in place since about 1990 (previously the cask quality was variable). Mr Campbell emphasised that The Ten Year Old is the standard by which all other Laphroaigs are measured. No matter what extra flavours they acquire from extended ageing or a change of cask, other bottlings must always express the same sweet, peaty, medicinal character. There is great balance in the Ten Year Old, with the sweetness reining in the strong earthy peat, and softening the effect of the bitter and dry notes in the finish. The defining flavour of Laphroaig is TCP, a heavy phenolic note which perhaps comes from the deep cut on the spirit still (Laphroaig has the longest foreshots of any Scotch distillery). To ensure consistency, each batch of the Ten Year Old has about 20% of whisky from the previous batch added to it. It is the distillery's most important product, and until 1980, the only one. Bottled at 40%, chill filtered, coloured, and widely available, for about £33. The Laphroaig Eighteen Year Old (about £70, 48%), which unlike the Ten is not chill filtered, was until tonight my favourite Laphroaig. The extra ageing adds a depth of fruity and perfumed wood character, and a superb creamy texture. The finish is deeply earthy. John Campbell describes the Eighteen as a “Dry-Sweet” whisky. Laphroaig Triple Wood (about £45, 48%) was introduced in 2010 (to travel retail, but now generally available). The maturation process is initially the same as for the Quarter Cask, and the whisky is then put to first fill Oloroso sherry hogsheads for two more years. It's a spicy whisky, with notes of red fruits, and the smokiness seems to have gained a caramel / butterscotch / crème brûlée note. Still very smoky-peaty-medicinal, of course. The first of tonight's drams to seem at all hot, and rather drier in the finish than the previous whiskies. 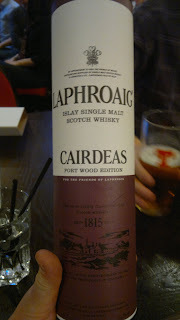 We were then given the first public tasting of the Laphroaig Cairdeas 2013. Initially the whisky followed the same path as the standard Ten Year Old, ageing in first fill ex-Bourbon, but after eight years it was transferred to 68 first fill Port pipes for 14 months. The last dram was a rare cask sample. John Campbell thinks that no one else in the Scotch whisky industry is using puncheons (a larger barrel-size, which is sometimes only half charred). These barrels were virgin European oak made for Laphroaig, although that must have been a fair while ago, since the dram we tasted is both twenty four years old and refill cask. As you would expect in a twenty-four year old whisky there is indeed a ton of woody character, but there are also attractive floral notes of hyacinth or violet, and the whisky is still very bright and fresh. On the palate is has a meaty note which wasn't in the younger whiskies. There is still plenty of peat, fruit, and cereal. The finish is bitter burnt. We finished the tasting with an old Ten Year old Laphroaig (probably bottled in the 1990s, pre-Royal Warrant, and 43%ABV). Apart from what I took to be a couple of signs of bottle ageing (a cabbage-y note, and a much softer mouth feel), the main difference compared with today's Ten Year Old seems to be that the smokiness is a little less earthy, a little more charred wood. A tribute to the consistency of Laphroaig? In another millennium I used to be a Laphroaig bore, finding other whiskies to be lacking in flavour. Whilst I certainly wouldn't go back to that position, I do think the Cairdeas 2013 is an outstanding dram. If you are on Islay this week or next for the Fèis Ìle, it's the bottle to buy. The rest of us will get a chance when it is offered to the Friends of Laphroaig in June.